Despite this being a low-volume holiday week, crude oil continues to plunge. West Texas Intermediate (WTI) crude oil is down $3.69 or 6.75% and Brent crude oil is down $3.60 or 5.75% today alone, which further confirms the concerns I had when when I wrote the article “Is A Crude Oil Liquidation Event Ahead?” on November 6th. In that piece, I warned that WTI crude oil’s technical breakdown below its key $65 level would likely lead to even more bearish action, which could then cause speculators or the “dumb money” to violently liquidate their large bullish position of nearly 500,000 net futures contracts. In today’s update, I will show the next key technical levels to watch and discuss the economic implications of crude oil’s crash of the past two months. 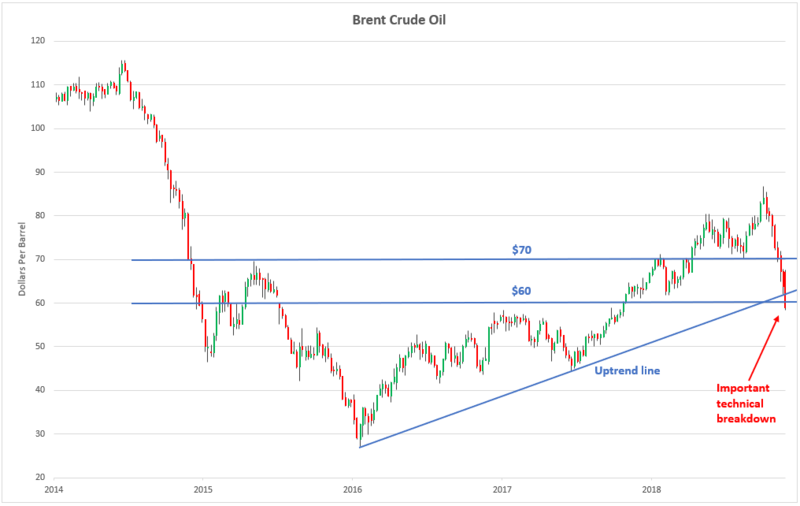 WTI crude oil keeps slicing below important technical levels: $60, $55, and the uptrend line that began in early-2016, which represents a very important and concerning technical breakdown. The next major support level to watch is $50; if WTI crude oil breaks below $50 in a convincing manner, it will likely try to gun for $40, then $30, and so on. Brent crude oil sliced below its $70 and $60 support levels along with the uptrend line that started in early-2016, which is a very bad omen that increases the probability of further bearish action provided it isn’t negated by a close back above this level. Why is crude oil selling off so sharply? There are a number of reasons, but the core reason is that global recession risk is rising (which is why the stock market is selling off along with oil). According to the Ned Davis Research chart below, global recession risk is now above 70. In September, I wrote a popular Forbes piece called “How Interest Rate Hikes Will Trigger The Next Financial Crisis” in which I showed how historic recessions, banking, and financial crises have occurred after interest rate hike cycles (the chart below is from that piece). I believe that dangerous bubbles have formed in emerging markets, U.S. stocks, the shale energy industry/energy junk bonds, tech startups, and other industries and countries after the Great Recession, and that rising interest rates are going to pop those bubbles and cause yet another financial and economic crisis.